We recently launched a new feature in Exist called custom tracking. You can read all about how custom tracking works here, but essentially it lets you create a tag for anything you want to track. Then you just add the tag to the days when that thing happened, and Exist will figure out over time how your tags relate to your other data. But today I want to look at how you can use custom tracking as a powerful habit tracker. One of the reasons I've used so many habit trackers in the past is that I wanted help to build healthy habits. Choosing the habits I wanted to build was easy, but figuring out how to make them stick was a lot harder. And that's where Exist comes in. Not only can it help you track which days you complete your habits, it can also help you uncover how those habits affect you, and how other parts of your day make it easier or harder to stick to your new habits. To start tracking your habits in Exist, you'll need an Exist account (create one here if you haven't already, and try it free for 30 days), and either Exist for Android or Exist for iOS. In either of our mobile apps you can turn on custom tracking from the settings screen. Once custom tracking is turned on, you can add tags from the Today tab by tapping on the custom tags card. You can add custom tags and rate your mood (if you have mood tracking turned on) for any day in the past week from the Timeline tab. And if you don't have your phone with you, you can even add a tag on the web. 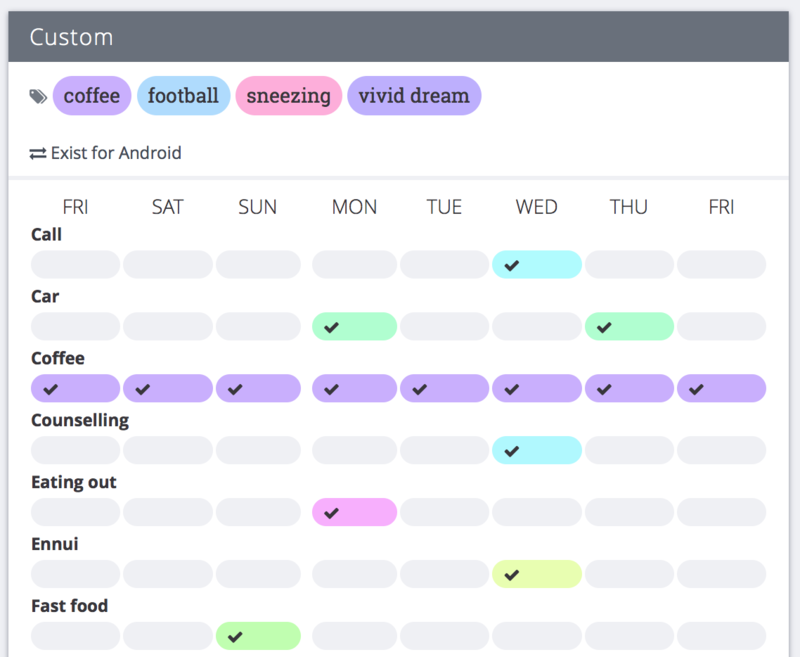 Once custom tracking is turned on from one of our apps you can add tags from the Mood Timeline screen on the web. 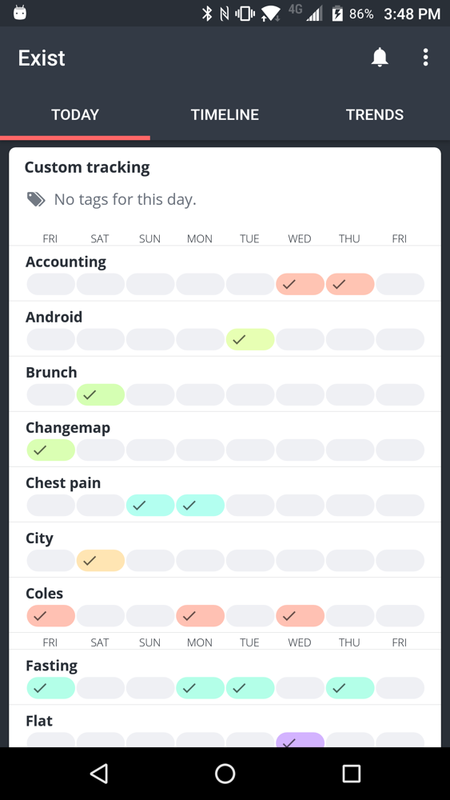 To start tracking, simply type a new tag for each of the habits you've completed today. New tags are created as you track them, so only add a new tag if you want to track it for today. We recommend you use nouns for your tags, such as "bike ride", "floss", or "french". 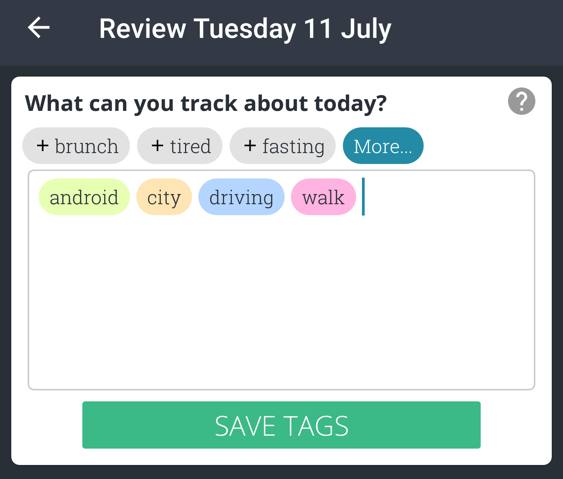 The app will suggest a few common tags to get you started, but you can create tags for anything you want to track. Each night, enter the tags for any habits you completed that day. You can turn on a reminder to review your day from the app's settings screen, as well. 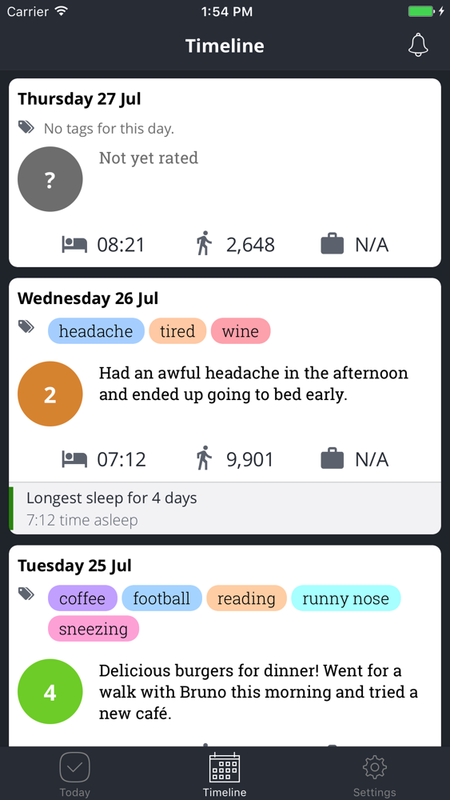 Or you can add tags throughout the day as you complete your habits. If you have Exist for Android, you'll see a graph of the past week on the Today tab. This graph will be coming to the iOS app in the future, too. You can see this same graph, as well as a longer version for the past 30 days, on the web as well. So far, we've covered basic habit tracking. 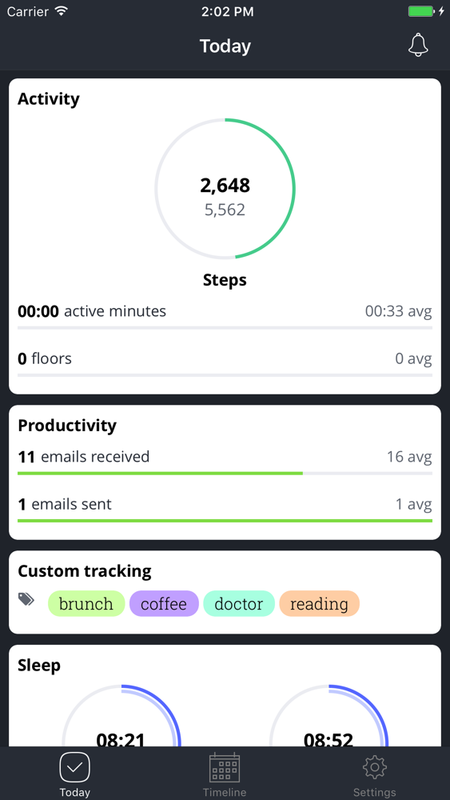 Most habit trackers can handle these features. Where Exist is different is in analysing your custom tags alongside all the other data you connect to Exist. Your custom tags are treated like the attributes that come from other services you connect to Exist, such as fitness trackers, Apple Health, or weather data. So Exist can look for correlations between your tags and the rest of your data. By finding correlations in your data, Exist can tell you how completing (or not completing) your habits affects you. For instance, I have a tough time practising piano regularly, but Exist tell me that when I do, I tend to rate my day more positively. I also know that going for a bike ride, which is a habit I'm trying to cultivate right now, tends to lead me to track "runny nose" and my allergy medication more, so perhaps being out in nature is contributing to my symptoms. But beyond how my habits affect me, Exist can also uncover clues about how to make my habits stick—or what makes them harder to stick to. I know that I'm less likely to work out, for instance, if I have more events on my calendar. Which might mean I need to plan ahead for those days and fit my workout in before I leave the house. I'm also more likely to practise piano on days I don't track "train" or "car", so it seems leaving the house for some kind of event or appointment is a clear blocker for my habits. From tracking my "bike ride" habit, I've found that I'm more likely to do this one when I spend less time on email. Both time spent in my email app and number of emails received tends to be lower on days I go for a bike ride. This tells me that I might be feeling too busy and/or stressed on days I'm getting and sending lots of emails. But a bike ride is a good way to relax, so I should keep this in mind next time I feel like I don't have time for it. Although we didn't design custom tracking to be a habit tracker specifically, we designed it to be flexible enough to use in whatever way suits you. It just so happens that using it for habit tracking opens up Exist's analysis to help you understand what helps—or hinders—you in building new habits. And for me, building habits that stick is the whole point of track them in the first place. Get started with custom tracking: sign up for a 30-day free trial of Exist.